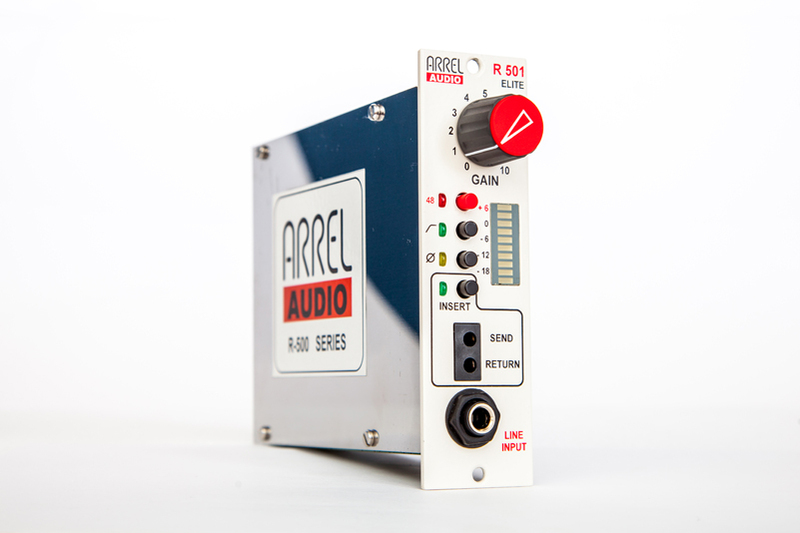 ARREL Audio R-501 Elite Mic-Line Preamplifier has been conceived to offer to the 500 series user the superior audio performance of the ARREL audio higher level product lines. The unit offers to the 500 user high reliability, rugged design, outstanding audio quality, versatility and ease of use typical of the tradition of ARREL Audio products. R-501 Elite is perfect for recording every kind of music from classic, pop/rock, electronic and in all the situations (live and recording studio) where maximum sound quality and special attention to dynamic range and signal to noise ratio is needed. The R-501 Elite technical specification shows that it is the perfect audio unit also for actual digital recording 24bit/192kHz environments where superior performance is required. R-501 Elite is based on the use of the latest circuit topologies, characterized by very low distortion, ultra-low noise and very wide frequency response. The amplifier architecture is based on two high dynamic range gain stages in order to avoid any saturation. Even if the input stage of the R-501 Elite could accept input signals up to +24 dBu, a special protection circuit limits the input level at +20 dBu in order to prevent any damage. The R-501 Elite extended input dynamic range avoids the necessity of the input pad and the gain is controlled by a single large knob. The absence of the input pad means better sonic performances. In fact the pad degrades sound quality and affects signal to noise ratio. The R-501 Elite is powered at ± 16 VDC as the traditional 500 Series units but internally the power supply is increased to ± 24 VDC providing 32 dBu of maximum output level avoiding any output saturation. The Line Input (unbalanced) is easily accessible from the front panel by a 1/4"' TRS jack, the jack insertion excludes the mic input. If a balanced line is connected to the Line Input, it will be automatically unbalanced (cold connected to ground). The two bantam connectors on the front panel provide an insert point (push button) that is extremely useful permitting the “on the fly” connection of out-board units without accessing the back panel. Four illuminated buttons are provided for Phantom Power, Phase inversion, LO-CUT filtering and Insert control. A LED bargraph (10 LEDs) is used to display the output level. R-501 Elite is dedicated (due to his absolute sonic level quality) to high professional vocal recordings, classical instruments, high dynamic range instruments such as drums and percussions. ARREL Audio products are designed and manufactured in Italy. Microphone Gain 70 dB range with a continuous potentiometer control. Line Input Unbalanced, Impedance 47 KΩ, Line level -4/-34 dBu, Max input level +20 dBu. 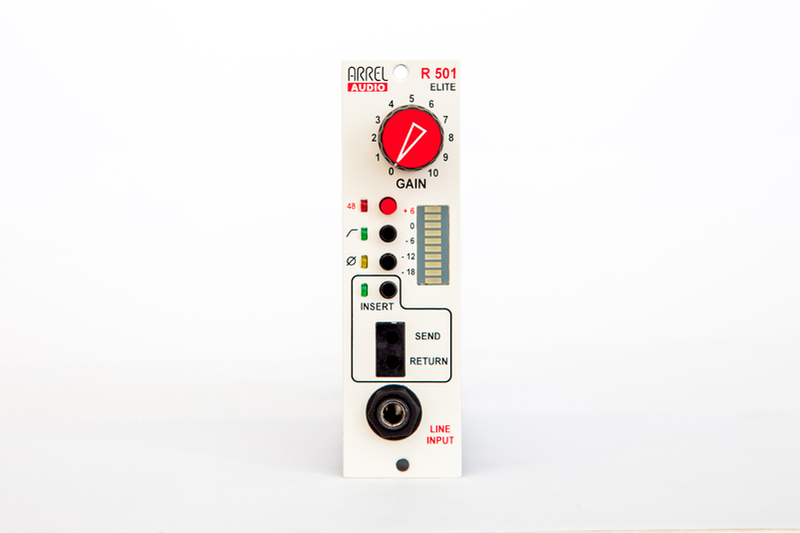 Line Gain 30 dB range with a continuous knob. Distortion + Noise <0.003% ( typical 0.001%). Output Level Electronically Balanced, Level +4 dBu, Max +32 dBu. Front Panel Controls 48V Phantom Power button, Lo-Cut button, Phase Reverse button, Insert Button. Front Panel Indicators Level Indicator 10-LED Bargraph (7x green, 3x red), 1.5 dB step, Range +6/-21 dBu, 4 LEDs (48V Phantom Power, Lo-Cut, Phase, Insert). Construction Compliant 500-series rack with PSU and external audio connections, Single 500-series rack slot required for each R-501 module. Very High Dynamic Range (VHDR) means that the saturation probability of the output stages is extremely low. This is obtained by using special rail to rail circuits and by increasing the power supply voltage of the analog circuits. Electromechanical tolerance means that electromechanical components are doubled in every situation in which maximum reliability it is important due to a frequent use (switches, push buttons, potentiometers). This technology in the 500 compatible series means that the modules can be cabled on the front panel by using bantam connectors without accessing the launch-box back panel. This is very useful in the needs of “on the fly” connections. In the ARREL preamplifiers, special input circuits and a high output dynamic range output stage guarantees no saturation, consequently the input pad is not required. This technology permits to power the ARREL Audio series 500 compatible modules at ±24 V with respect to ±16 V volts of the traditional launch-box obtaining a maximum output level of +32 dBu avoiding any saturation. The special circuit that increases the power supply is inside the ARREL Audio modules so traditional launch-boxes can be used.